The texts for the first week of Lent in year B are distinctive and rough and play on each other in my reading. The central concern is testing. 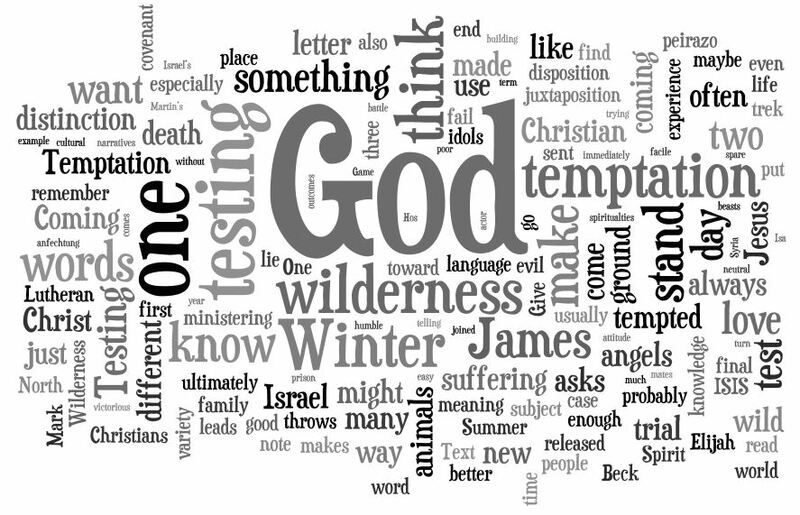 This sermon, following James, attempts to create a distinction between temptation and testing. It then looks at the testing of Jesus and the testing of Abraham as examples of standing under testing. The parallel is OT Israel who strayed under their testing in the wilderness. The application section then looks at a couple of example of modern day testing at the hands of ISIS. It ends by making a comparison between a spirituality that survives the Winter vs. the seemingly sunnier spirituality that ultimately fails in the cold winds. The opening hymn is Christ the Life of All the Living (LSB 420) which is a classic Lenten hymn emphasizing exactly our wintery reliance on Christ alone. The choir echoes after the OT lesson with teach me your ways Lord. I didn’t get recorded, but after the sermon we sang one of my favorite hymns that captures this wintery Spirituality, Rise! To Arms! With Prayer Employ You (LSB 668). Our effort is not to moral perfection but to prayer. Of course part of the greatness is the chance to sing the hymn tune Wachet Auf. Peter Thiel was one of the founders of PayPal and one of the first investor in Facebook. But unlike most highly successful businessmen, he has a philosophical disposition. He attempts to distill his experience not into phrases that are clichés the minute they are uttered meaning nothing, but some of surprising depth. His recent book title is the example I want to steal for a second – Zero to One. At a simple business level what he throws out of his venture capital office is any business pitching 1 to 2 or 1 to any number. If the presentation can be reduced to “I want to be the next Facebook”, Mr. Thiel isn’t interested. He wants to invest is businesses that are going from zero to one. If you want investment, come up with an idea that nobody is really doing. Now how does this apply to on Ash Wednesday? There are lots of religions and even lots of Christian churches that are about 1 to 2. And by that I mean they are preaching a gospel of self-improvement. Do this, do that, have your best life now, the power of positive thinking, and every other cliché. You never get THE ONE in that method. Clinging to the zero, The ONE is given by grace. Ashes to Ashes, Dust to Dust. You don’t get much more zero than that. I know my transgression, and my sin is ever before me. Create in me a clean heart, O God. No continuous improvement there, but creation. You only get God, the ONE, when there are no others before Him – not even yourself, maybe especially ourselves. Hence on Ash Wednesday the ashes, a clear expression of our personal spiritual zero. And when we remove the other Gods, when we cling to the zero, God is pleased to take up residence with us. To restore to us the joy of His salvation, and uphold us with a willing spirit. To take us from the last seat at the banquet to a seat of honor. To give to the prodigal the coat and the ring and the fattened calf. The reading from Joel is interesting in this way. Israel had been hit by a plague of locusts. It wasn’t just any plague, but everything had been eaten and destroyed. So much so that the elements of the sin offerings – grain and wine and oil – had be removed. It was a very literal demonstration of Israel’s zero. There outward circumstance reflected the state of their hearts. Would they embrace the truth, or continue in pride? “Rend you hearts and not your garments. Return to the Lord, for he is gracious…abounding in steadfast love…who knows…he might relent and leave a blessing behind him, a grain offering and a drink offering.” In other words the Lord might leave the sin offering for them. And that is exactly what He did in Jesus Christ. For all who cling to their zero, he’s given THE ONE, our sin offering. Blessed are the poor in Spirit, for theirs is the Kingdom of Heaven. Grace and truth go together. The ONE, God is found in the weak places – contrite hearts and crosses. Amen. 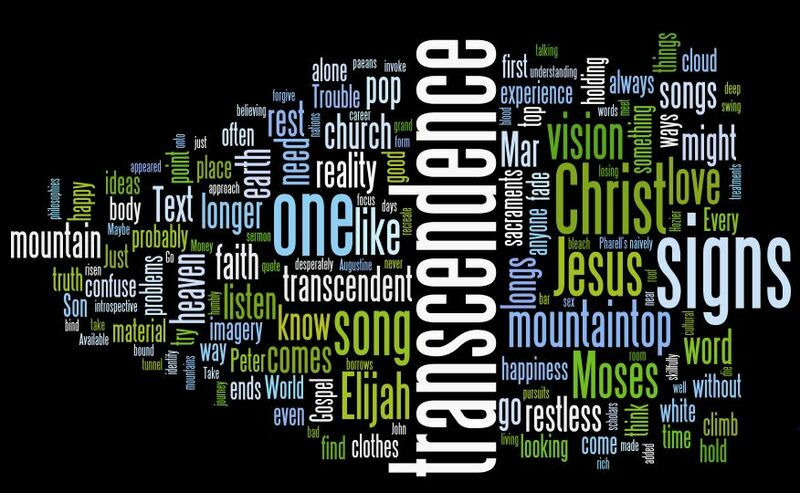 One of the things I think is constant in our experience is a desire for the transcendent. I’ll use as a quick definition of the transcendent something that is larger that we are. Augustine recognized this in his phrase “we are restless until we find our rest in you”. The biblical text is the Transfiguration, a direct experience of the transcendent and the reaction of Peter. What the sermon attempts to do is first demonstrate that we aren’t any different. We long for transcendence and we cling desperately to its signs. It does this primarily by looking at pop music which in my head expresses openly our common longings. The second step is to point out what actually happens on the mountaintop. Jesus is left alone and the voice says listen to him. Instead of clinging to the fleeting signs of transcendence, we have the reality, Jesus Christ. And his words tells us where we can find him. We are restless until we find our rest in him. The hymn of the day captured in the recording points at one of those places we see face to face: Lutheran Service Book 631 – Here, O My Lord, I See Thee Face to Face. All the words and some history of the hymn are here. Here is the LSB link which has an extra verse and is set to an interesting/different hymn tune compared to the most standard. Our Pastor’s circuit meetings always start with worship. The host, which this past week was St. Mark, is the presiding minister. Sometimes you get the previous Sunday sermon. Sometimes you get a recent “good one”. Since audience recognition is an important part of any sermon, I recognized that for me editing a sermon intended for the congregation for a group of pastors would often be just as much work as starting fresh. The second part of that is the topic to this group modifies itself. You can use a little more theological slang or shorthand for ideas. Your biblical allusions which make the sermon think and resonant don’t have to be quite as readily apparent. And what they are typically worrying about is a derivative of the congregational worries. In this case the congregation might wonder how Christ works in their life or what is the purpose of the Christ. The simple answer is the forgiveness of sins. So you preach that pointing at word and sacrament. To the pastor’s group the worry might shift in a couple of ways: am I being faithful in that calling to preach, and does this really work especially with a flawed servant? In this specific case, are the numbers telling me I’m a loser or a heretic. The proclamation, if it works as I would hope, works as the law to call preachers to faithfulness in their preaching and works as the gospel to calm fears about its power and effectiveness as measured by simple worldly standards. So, I didn’t record it. I wavered about posting it, but if you want to get a glimpse at a message for pastors. Take a read.